It's the bottom of the ninth inning. The game is tied. It's down to the home team to score one run to win it all. Unfortunately, the home team is staring down the league's best closer. A dice and card game for two players, Bottom of the 9th brings all the excitement of the final three outs of a baseball game into a compact 5-20 minute game session. With variable player strengths, bluffing/deduction, and die-rolling, only the pitcher knows what's coming and the batter needs to keep his eyes peeled. Bottom of the 9th is played over the course of three outs, or four hits (for one run scored) — whichever occurs first. Bottom of the 9th includes tons of variable player powers, myriad customizable line-ups, the possibility of two added expansion packs, and rules for advanced league and solo play to keep gamers wanting to play ball time and time again. 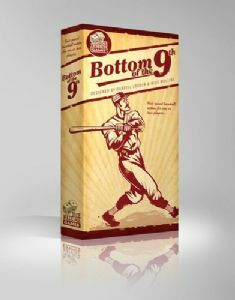 The Hitters Pack is a small, booster pack expansion to our wildly popular game, Bottom of the 9th. In the Hitters Pack players get 12 new batter cards to pick from and add to their all-star line up. 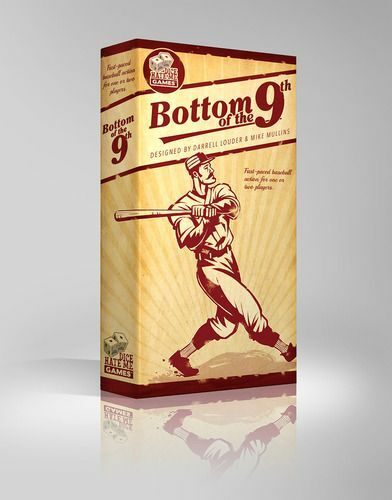 The Pitchers Pack is a small, booster pack expansion to our wildly popular game, Bottom of the 9th. In the Pitchers Pack players get 12 new pitcher cards to pick from and add to their all-star line up. Big League Support is a full expansion for Bottom of the 9th. It includes 12 players (including B. Weaver, Reld Nahcire, and J.A. Kapowski) and 1 stick of "gum". Sentinels of the Ninth is a full expansion for Bottom of the 9th. It includes 12 players, including Legacy, Tempest, Haka, Mr. Chomps, and Mr. Fixer, and 1 stick of "gum".